After a pleasant day of wine tasting, I like to kill a few zombies. What red-blooded woman wouldn’t? Still, pairing these odd but enjoyable outings seems strange — until you’re struck with the fever. The Delta fever, that is. A band of girlfriends and I drove to Antioch last week, then turned north on the River Road. In the rearview mirror we could see the urban sprawl dissolve into vast fields of farmland, connected by fingers of brackish water. Past the levees and sloughs that make up some 1,300 square miles of the Sacramento-San Joaquin River Delta, we were struck by its raw beauty. In many ways, this network of small towns and marinas looks much like it must have in the Gold Rush. It wasn’t long before the watery sloughs turned to vineyards and a handsome brick building came into view. This was our first stop — the Old Sugar Mill in Clarksburg. Built in the mid-1930s, the mill closed in 1993 and reopened as a tasting and wine crush facility in 2002. Today, it’s a popular wedding and party site housing 10 local wineries in what’s known as the Clarksburg appellation. We snuggled up to the bar inside Three Wine Company, owned by Matt Cline, of Cline Cellars fame. The Cline family’s century-old vineyard in Oakley produces heady zins and petite sirahs, and their cooler-climate grapes make lightly oaked chardonnay and delicious albarino and rieslings. We bought several bottles (including a Cal Bears-embossed 2005 Carignane) and then piled in the car and drove over the bridge to the Freeport Bar and Grill, where the number of diners exceeds the total population of the town (38 in the last census). You can get a good meal in Freeport, which we needed for the task ahead. 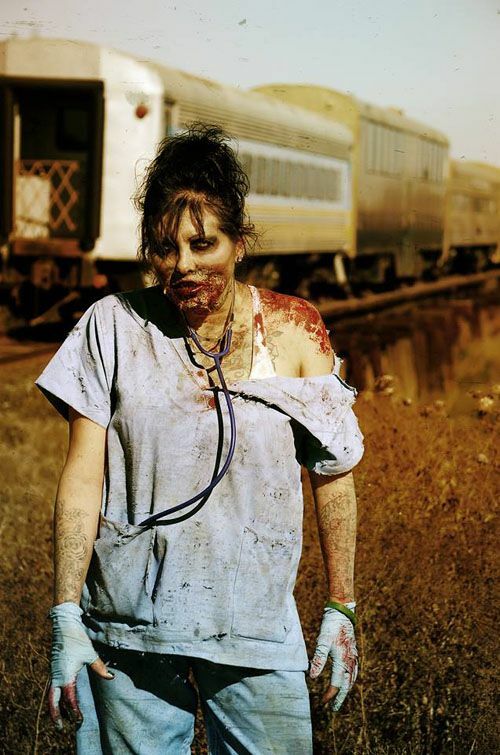 Our mission — and we chose to accept it — was to kill the zombies who were taking up residence along the tracks of the Sacramento River Train. We fueled up in Freeport and headed, under cover of darkness, to the West Sacramento train station. The throbbing beat of heavy metal music seemed to amp up the troops. We boarded the train and were issued our black laser guns — specially made in Australia. Every man, woman and child “manned” a quadrant as the Zombie Train slipped slowly through the shadows of a land that time forgot. The undead could be anywhere — hiding in the vineyards or deep in the reeds near the riverbank. At the end of the night, I notched 54 kills on my ammo belt — and hundreds of spontaneous giggles. Back at the station, we took photos with our victims, members of an actor’s group out of Sacramento. Discovering a zombie troop was the topper on a day full of surprises in California’s North Delta.